A short and clean landing page elementor template for mortgage & financial services. Because of the fact no heavy imagery is used you can easily use this for any niche and business and customize it as per your need using easy to use elementor page builder. This is a short, clean & minimal elementor template for mortgage, financial services or any other purpose. 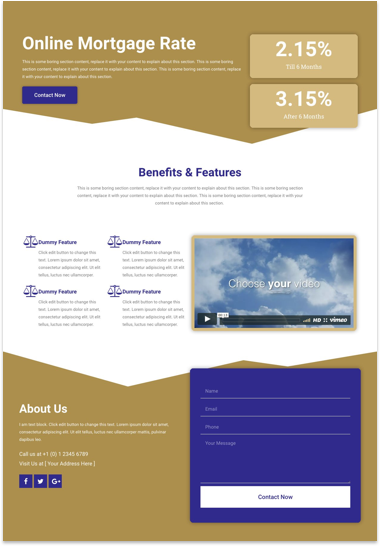 There is no fancy stuff in this template on the fact that it is for financial niche and this is a short one as well just to serve the basic sections for a landing page, but you can easily add more sections as per your need and do any other alterations easily. It’s a simple 2 column layout with content on left & counter module used on right. Than it utilizes the elementor shape divider feature on bottom as well. A simple section with no background or any fancy thing just to make sure it’s clean and the content takes full focus here. Again as similar to hero section this is a simple 2 column layout and have same shape divider but on top.